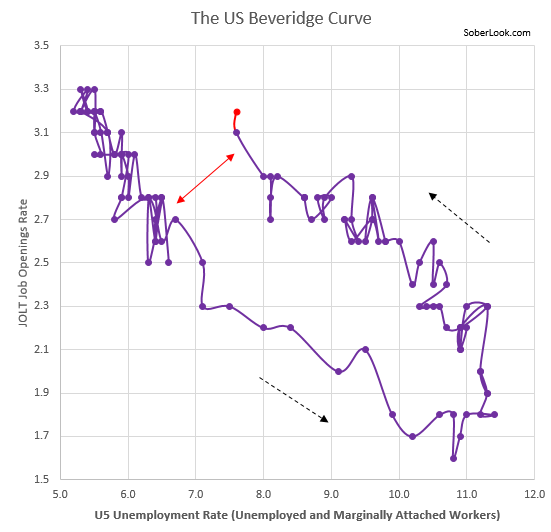 The Beveridge Curve, a scatter plot of job openings vs. the unemployment rate, continues to show a structural shift in US job markets. A large part of this shift is the skills mismatch. Companies are increasingly looking for skilled and experienced workers and are having a tough time filling those openings. If you are in retail for example, you will have no problems getting part and full time workers to stock the shelves in your store or run the cash register. On the other hand finding someone with the skills to run a store, even a really small one, is becoming more of a challenge. You'll get dozens of resumes to be sure, but very few with the right qualifications. One can see this effect in the small business survey data, as more firms are having a tough time filling openings. The US has millions of unemployed or "marginally attached" workers, yet these are not the workers companies want. Some would say that the reason firms are not getting the workers they want is poor pay. But if you are unemployed - and those of us who have been there know - low pay generally beats the unemployment benefits. Furthermore, at least across small businesses, pay is on the rise. No, it's nothing like it was before the recession, but those days are long gone. Another sign of the American skills mismatch is small business consistently complaining about the quality of labor - something that was much less of an issue a year ago. We can see other examples of this broadening skills gap here and here. Wages for skilled workers will rise faster than the national average as demand grows. Unfortunately those with limited skills will continue to struggle with stagnant wages and limited opportunities. The days when unskilled workers could easily get a well-paying job in construction are not coming back for some time. Welcome to the New Normal.